See the color of that frosting? I've come to the realization that it, indeed, is my favorite color in all the land. What would we call it? Teal? Mint? Seafoam Green? Whatever it is, I love it with my whole heart and have noticed that, over the years, I have come to purchase MANY things in that hue. Like, shirts. Purses. Furniture. Nail Polish. Towels. Sheets. Jewelry. Sharpies. Bowls. I mean, really....you name it, I most likely have it in some sort of shade of this color. All unintentional too, I swear. I was laughing the other night with some girls from my book club about this very thing. Someone had the gorgeous color on them and I said (way too excitedly might I add), "OoOoOoo! I just love that color!!!" Then they noticed that I was wearing it as well, sitting by my notebook (in that color), and crossing my legs next to my purse (yep, you guessed it...in that color). Sheesh. I seriously had NO clue this was going on. 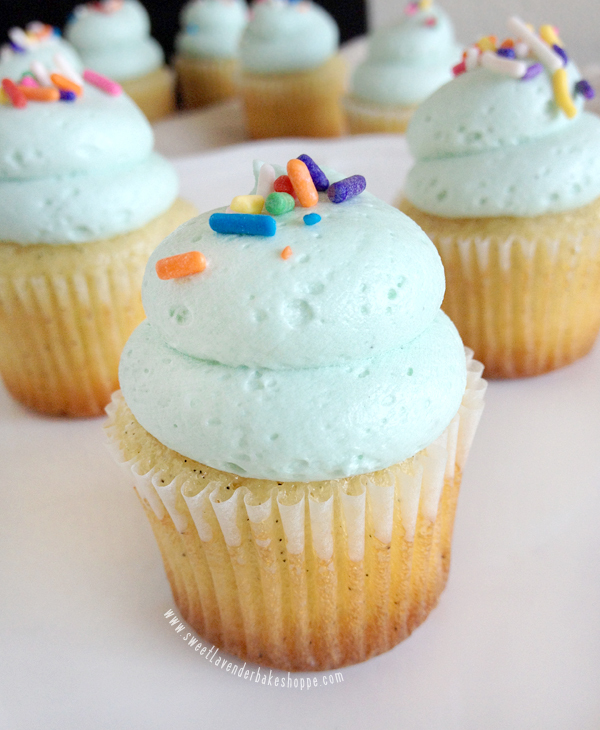 So, really...when making vanilla frosting, it only made sense to tint it in the softest hue of Minty Teal Seafoam. Either that or have an intervention. I have to admit- when it comes to frostings...I choose buttercream frostings made the old fashioned way with butter and egg whites. There are a few different types- French, Swiss and Italian- with Swiss being my ultimate favorite. Yep, you have to make a meringue. Yeah, there's a chance it could break (but almost always fixable). Sure, it takes a while to complete. But the end result is SO GOOD. Silky, fluffy, light as air, and totally delicious. It's the way I learned while at culinary school and it's the way I continued throughout my professional career. 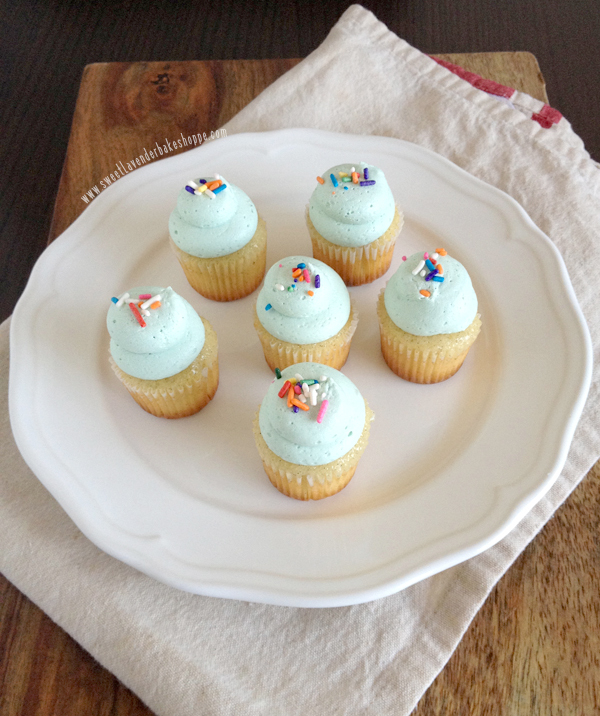 Basically, Swiss Buttercream Frosting is my go-to whenever I have a cake or cupcake to make. Interested in trying it out? Here's a recipe for Pink Lemonade Swiss Buttercream, Fresh Strawberry, Salted Caramel, and Real Peanut Butter. THAT being said, I know there are a lot of really good frostings out there! Many kinds that aren't the traditional buttercream and that don't involve eggs whatsoever. 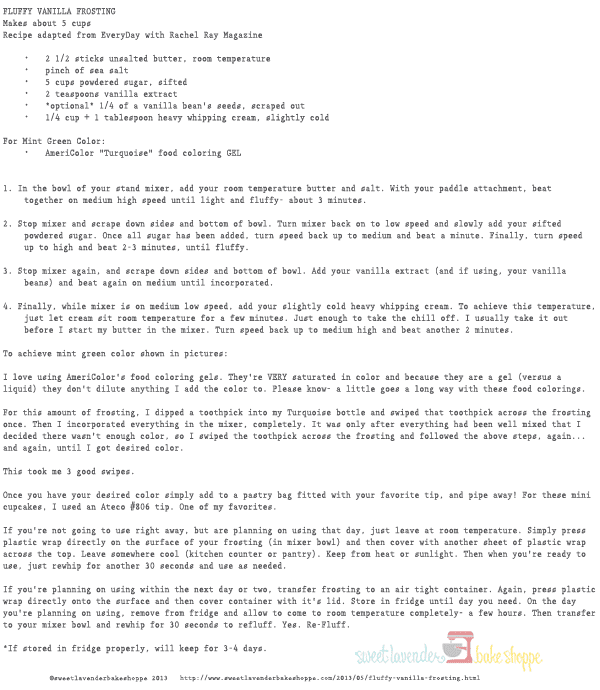 So, wanting to have an array of frostings for you to choose from on this here blog, from the easiest to the more difficult- I decided to have a more homey/the-kind-mom-used-to-make frosting in my repertoire. This couldn't be easier, takes about 10 minutes total to make, and is seriously, amazingly delicious. 1. In the bowl of your stand mixer, add your room temperature butter and salt. With your paddle attachment, beat together on medium high speed until light and fluffy- about 3 minutes. 2. Stop mixer and scrape down sides and bottom of bowl. Turn mixer back on to low speed and slowly add your sifted powdered sugar. Once all sugar has been added, turn speed back up to medium and beat a minute. Finally, turn speed up to high and beat 2-3 minutes, until fluffy. 3. Stop mixer again, and scrape down sides and bottom of bowl. Add your vanilla extract (and if using, your vanilla beans) and beat again on medium until incorporated. 4. Finally, while mixer is on medium low speed, add your slightly cold heavy whipping cream. To achieve this temperature, just let cream sit room temperature for a few minutes. Just enough to take the chill off. I usually take it out before I start my butter in the mixer. Turn speed back up to medium high and beat another 2 minutes. I love using AmeriColor's food coloring gels. They're VERY saturated in color and because they are a gel (versus a liquid) they don't dilute anything I add the color to. Please know- a little goes a long way with these food colorings. For this amount of frosting, I dipped a toothpick into my Turquoise bottle and swiped that toothpick across the frosting once. Then I incorporated everything in the mixer, completely. It was only after everything had been well mixed that I decided there wasn't enough color, so I swiped the toothpick across the frosting and followed the above steps, again...and again, until I got desired color. This took me 3 good swipes. Once you have your desired color simply add to a pastry bag fitted with your favorite tip, and pipe away! 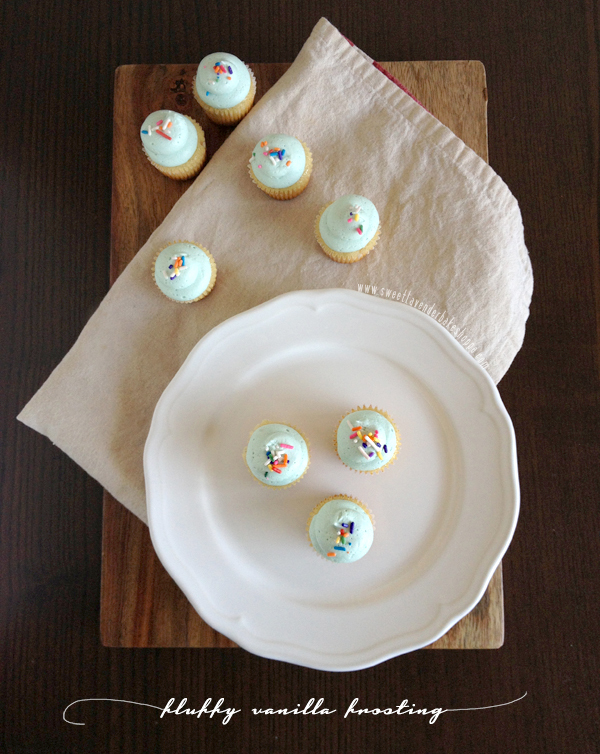 For these mini cupcakes, I used an Ateco #806 tip. One of my favorites. If you're looking for a yummy vanilla cake, here's a great one. If you're not going to use frosting right away, but are planning on using that day, just leave at room temperature. Simply press plastic wrap directly on the surface of your frosting (in mixer bowl) and then cover with another sheet of plastic wrap across the top. Leave somewhere cool (kitchen counter or pantry). Keep from heat or sunlight. Then when you're ready to use, just rewhip for another 30 seconds and use as needed. If you're planning on using within the next day or two, transfer frosting to an air tight container. Again, press plastic wrap directly onto the surface and then cover container with it's lid. Store in fridge until day you need. On the day you're planning on using, remove from fridge and allow to come to room temperature completely- a few hours. Then transfer to your mixer bowl and rewhip for 30 seconds to refluff. Yes. Re-Fluff. *If stored in fridge properly, will keep for 3-4 days. I was directed to your blog by your husband via etsy. I am excited to look around. Aww hi! Yes! He was just telling me all about you :) Welcome, friend! oh my goodness. I'm your new biggest fan. Everything is so pretty and delicious! I'm a big fan of details, and girl... you've got it down. Awwww, love it!!! Thank you so much! Like whoa, gurl. This really was a great new recipe! just got done making this frosting for my son's 2nd birthday cake today. it is A M A Z I N G. and so easy. thank you thank you! this just became a family favorite.